I think I had already evolved my thinking about what role those private graph social services were playing in my life. I didn’t feel that they were appropriate as a starting point for people to get to know me. Then I thought about my blog, I am on the board of WordPress, but then I also thought about the fact that my blog is always outdated. I am also not a very good writer, so I didn’t think that would be a good place. And Twitter, I though, was too random. What came to mind was a splash page – a page that that would make it really easy for people who are curious about someone to learn who that person is from the perspective of the person itself. A couple of years later and splash pages were in use but mostly by the “cool kids” of the tech sphere – people who had the technical knowledge to build them from scratch. The goal of about.me was to allow everyone to make an attractive and holistic page for themselves, no programming or design knowledge needed. Social media services such as Facebook, Twitter, LinkedIn do wonders when it comes catering to different aspects of our personalities but fail to present us as complex human beings. Facebook shows us at our most relaxed and private, Twitter features our random thoughts and opinions, and LinkedIn, while it’s the closest to what we need in a professional sense, still shows only professional side of us. Those things are all important and I use them all, I just don’t think any of them should be given the role of defining me. And if you don’t define yourself you either get defined in that very narrow way, you LinkedIn profile is a good example, or you leave it to Google. And for those of you tuning in and saying “Ah, I am not sure I want to have a public profile” – everybody has a public profile. It’s Google. So you should not give them that authority over definition and telling your story of who you are. You should tell your story. One of the most frequently asked questions when it comes to building your personal brand is how should you go about it if you still don’t have that much to show. The good thing is that young people who ask these questions recognize that by actively managing your personal brand you take control over that “first impression”. As Tony noticed, the initial contact we make with people today is happening more online than offline. We have to ask ourselves what is the message we want to send. The real challenge for college students and recent graduates it the fact that while they do have what can be considered lifetime experiences, do not have professional experiences in a conventional sense, experiences that would be fitting for a LinkedIn profile. If you are a college person looking for an internship, are you going to send you LinkedIn page? Most people would look like losers on LinkedIn at this stage. I know I would have. One of the things we introduced at about.me was a feature called Backstory. After you set up your page it allows you to connect a resume to that page. And the reason why I think that is so important is that it reflects the way life and job interviews actually happen. The good thing about about.me profile is that it starts with a picture – a picture that captures who you are in this moment and as such tells a bit about you. After putting up your picture you have the option of entering you bio, which you can leave blank or write a little something about yourself. What people usually do, and Tony gave his own example here, is start broad, by saying what are doing at the moment, and then go into the “more important part of my narrative, that capture the authentic true human being that I am”. While his profile starts by listing his involvement with about.me, True Ventures and placements at boards of different companies, he also makes room for his background. He talks about his beginnings in a small farming community and jobs he did along the way. When people see that, what they realize is that I am just like you… [With LinkedIn] There is no place for those jobs and those experiences to be integrated into my narrative. In about.me that is natural piece of it and to me that is the most powerful thing about people. It tells so much – that you are industrious, forward looking, real. That is the real opportunity that we have. In addition to that, you have a Backstory as a more relaxed version of your resume. Tony says that when he is interviewing someone he starts by saying “Tell me something about yourself”, as most interviews do. They start that way because you want to make people more relaxed and to find that personal connection with the person you are interviewing. That is exactly what about.me profile does for you online. It starts off with your best card – who you are, what is your outlook, what are your aspirations in life – and then goes into the details of your story. 1. Influencing their placement on Google results. You cannot get rid of bad things about you. You cannot edit Google, it’s out there. The best thing you can do is to drive traffic towards pages you create, which you want to have ranked high. The ranking of pages on Google depends on their relevance. One of the ways Google determines relevance is but tracking how many times that page has been linked to from other places on the Internet. The nature of about.me pages allows them to rank high almost immediately. You link you social media profiles, websites and other online profiles to your page when you create it. That immediately gives it relevance. More importantly, you place links to your about.me page on those same social media profiles – on your Facebook profile, Twitter bio, and you email signature. Ask yourself in which situations people get curious about you and decrease the chances of people Googling you. Sure enough, if you meet people in a social setting they might go home and Google you. But a lot of this is happening online. Increasingly so. They see you on Twitter, or they see you on Instagram, but they are kind of interested in who you are. Or they are in email exchange with you for whatever reason and they are interested in who you are… To me it’s crazy to not actually point people to the page you want to point them to so they don’t do a Google search in the first place. Make sure you do put the link to your page in your email signature and your twitter bio. Everywhere you think people might get interested and want to know more about who you are. Same goes for recruiters. Why would you take a change of your potential employer Googling you and your Facebook profile being the first thing they see? You have just one opportunity to make a first impression. Make it count. The presentation layer is not enough; you have to be active, both online and offline. Having a personal page can significantly advance your career. In fact, the research we did on personal websites and their connection to career success showed that almost 90% of personal website owners have benefited from having a personal website. But personal website alone, no matter if you chose a splash page or an elaborate website, is not enough. Tony agrees. You have to make your identity go to work for you and make it a tool for you to accomplish whatever it is that you want to do. Whatever you goal is, you have to be active in the community you want to be a part of – online and offline. For those that are just starting, a great way to attract someone’s attention, as Tony advises, is to leave comments on their social media posts. Those people probably get too many comments per day but one of the ways to be noticed is for that comment to express thoughtfulness and some sort of connection. Another part is going to conferences and physically engaging with your community. There is no silver bullet for meeting people; you have to be out there. And this should not be a short-term tactics but a long-term strategy that will allow you to continuously expand your circle or friends and acquaintances. It is all about consistency and thoughtfulness in the way you approach and network with people. There was one message that was woven through this live stream – the importance of being authentic. 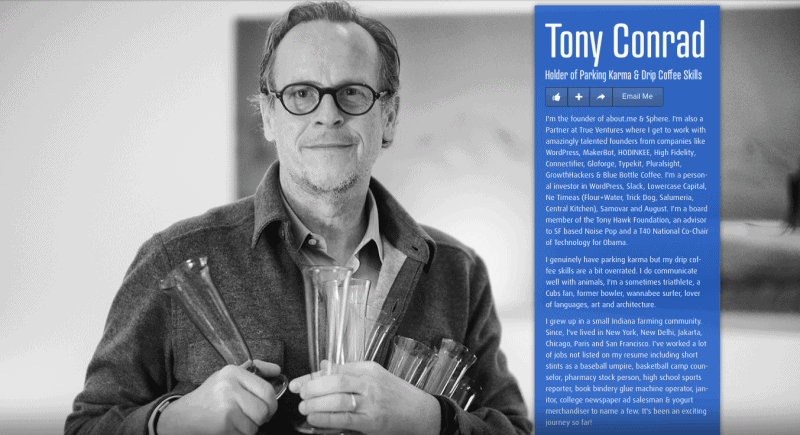 Tony believes that everyone has an interesting story and something valuable to say. No matter the background. Advantages or disadvantages, career shifts, humbling jobs or negative search results. After all, whatever happens to you in life, good or bad, the most important thing is what have you done with it, what have you made of yourself. Those experiences are what shaped who you are today and have significantly impacted your narrative. The power is not in covering up your past, but acknowledging it and learning from it. Be authentic. Own what you have done. Do not discount it at all. It’s amazing if you think about the context and where it’s headed.